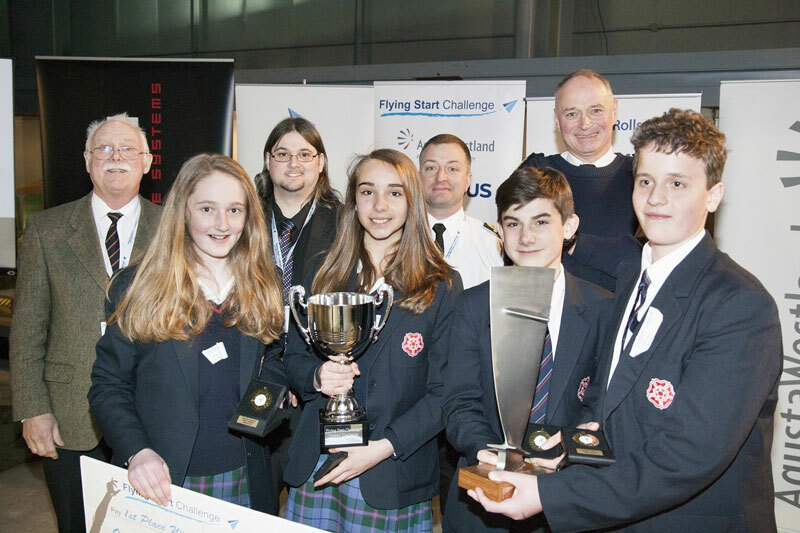 10 March 2016 – The ‘Flying Four’ team from Clifton High was named 2015-16 champion at the Flying Start Challenge Grand Final yesterday, which took place at the Fleet Air Arm Museum. They beat ‘Poseidon’ from Cotham and ‘The Wandering Albatrosses’ from Huish Episcopi into second and third places respectively. As well as the final fly-off, students were challenged on a number of activities to test their engineering acumen, technical capabilities and creativity. Their first task was to make a parachute and basket to drop an egg safely into a target area with a limited amount of paper, masking tape, straws, string, and a black bin liner. Their second task was a test of teamwork and required the students to work together in order to build an undercarriage structure that could hold up to 20kg of weight out of nothing but rolled up A4 paper, masking tape and nuts and bolts. Overall Activities Winner was ‘Pegasus’ from Cheltenham College Preparatory School, Undercarriage Activity Winner was ‘When’ from Melksham Oak, and Parachute Activity Winner was ‘Thundering Typhoons’ from Huish Episcopi. During the morning, ‘Rocket Russ’ gave a truly educational and exciting speech highlighting the difference between rockets and missiles, and presenting stunning videos of his own rocket launches. A rocket launch was planned a few days after the Grand Final. Students also had the opportunity to engage with ‘Engineers without Borders’ interactive demonstrations on “Access to Power” and “Access to Water” during the afternoon.